Presented here is original art from his Progressions exhibit, a retrospective spanning more than 50 years. Shown in chronological order, these examples of Syd's imagination begin with a Bugatti concept as a young design student in 1957, and trace his progression through the '60s, '70s, '80s, '90s, '00s and '10s. Born in St. Paul, Minnesota and raised in Colorado Springs, Syd graduated with distinction from the prestigious Art Center College of Design in Los Angeles in 1959. His career began at Ford Motor Company's Advanced Styling Studio in Dearborn, leading in 1970 to the formation of Syd Mead, Inc. in Detroit. His designs and illustrations earned major contracts for Philips, Sony, Honda, Minolta, Bandai, Intercontinental Hotels and many other international clients. Design opportunities increased after moving to California in 1975, leading to work on his first movie project, Star Trek: The Motion Picture, then in later years, Bladerunner, Tron, 2010, Aliens, Mission Impossible III and, most recently, Elysium. Transportation design remains his first love, however, whether it's show cars, solar-powered unicycles, luxury yachts, cruise ships, or spacecraft. Bold designs set in extraordinary surroundings produce the visual narratives that have become a Syd Mead trademark. Syd periodically holds one-man exhibitions in different countries. He began in Germany in 1973 and has since exhibited in Japan, Italy, Spain, and all over the United States. In 1996, his Cavalcade to the Crimson Castle with 114 original paintings and illustrations had a three month showing at the Center for the Arts in San Francisco. His personal appearance there, and subsequently at schools across the country attract sellout audiences. Progressions debuted at the Forest Lawn Gallery of Fine Arts in Glendale, California in 2012 and continues to draw record crowds as it travels to galleries nationwide. Syd also lectures to corporate and academic entities. It started with Chrysler in 1983 and continues today with clients such as Disney, Carnegie Mellon, Purdue, Pratt, and many others around the world, including a four-city tour of Australia, to capacity audiences. In 1998, Syd Mead relocated his studio to Pasadena, California. His unique imagination continues to allow us a fascinating glimpse into the future with a variety of new projects. 1959: Ford Motor Company — Advanced Styling Center in Dearborn, Michigan. 1961: US Steel — futuristic paintings for a booklet. 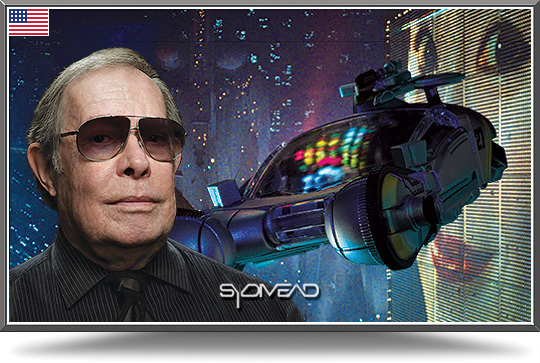 1970: Syd Mead, Inc. — company established. 1976: Sentinel — book of designs published. 1980: Blade Runner — visual futurist, designing cityscapes and vehicles. 1980: Tron — conceptual artist, designing light cycles, solar sailers, and carriers. 1983: 2010 — visual futurist, designing the Leonov spaceship. 1985: Aliens — conceptual artist and 'Sulaco' spaceship design. 1985: Short Circuit — consultant and designer of the 'Johnny 5’ robot. 1985: Oblagon — book published. 1987: Yamato 2520 — designed space cruisers, fighters, props and costumes. 1988: UFO Cover-Up? Live! — conceptual futurist. 1988: L.A. 2013 — artist for article in the Los Angeles Times. 1991: Kronolog — design book published. 1991: Terraforming — designed backgrounds and spacecraft for the video game. 1992: From Time to Time — production designer for the future Paris. 1993: CyberRace — designed vehicles for the computer game. 1994: Timecop — visual consultant on designs for guns and time machine. 1994: Strange Days — designed 'sim-stim' playback deck and 'trodes' headgear. 1995: Cyber Speedway — designed vehicles for the Sega game. 1997: Wing Commander: Prophecy — conceptual artist for aliens on computer game. 1998: Turn A Gundam — designed mobile suit ‘mecha' for the anime. 2000: Mission to Mars — conceptual artist and vehicle design. 2001: Sentury — book published. 2003: Tron 2.0 — designed a new light cycle for the PC game. 2004: Gnomon Workshop — educational DVDs. 2005: Mission: Impossible III — mask maker machine design. 2008: Aliens: Colonial Marines — designed the ‘Sulaco' for Gearbox Software. 2008: Exposé 6 — Grand Master Award from Ballistic Publishing. 2010: Sentury II — book published.